The board shows various terrain areas with a river passing through some and the 8 Mongol leaders start on the board. Next to the board are various Tetris-ish shaped tiles. The goal is to place and own these to score points. Invade – Playing a card from their hand allows the player to place a yurt of their colour in any space of the region that matches their card, i.e. desert region, mountain region, next to a river, etc. Conquer – A player can place one of the shaped tiles so long as every space that it covers contains a yurt (including at least one of their own). Ignoring the neutral yurts, the player(s) who have the most yurts in the covered area scores the points printed on the tile. Note that players without a majority of their yurts get nothing. When any leader has placed all of their 5 neutral yurts they are removed and the game end phase starts when 5 leaders have been removed. 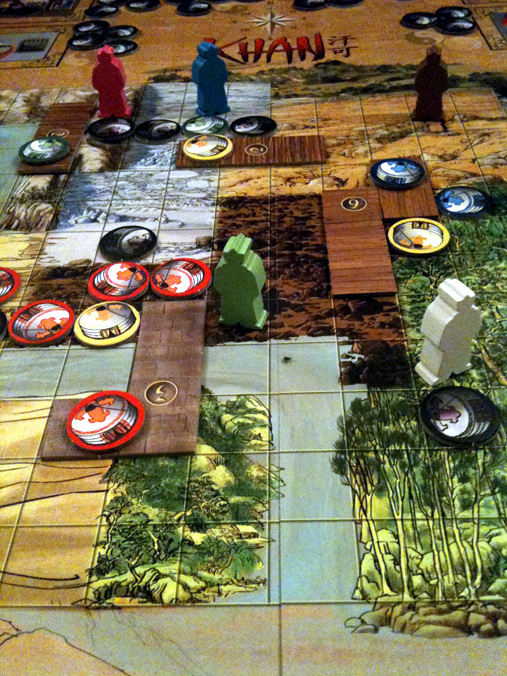 During the end phase, players get 2 conquer actions each turn until no more tiles can be placed. Highest total points wins and there are bonus points for the 3 players with the biggest contiguous tiled area. Khan is actually a simple game but there’s lots of interaction between the players. I always think it’s a good sign for a game if you’re always torn between which actions you should perform and you constantly want ‘just 1 more action’. You constantly need to calculate how to (a) use your cards well, (b) place yurts (both yours and neutral ones) to allow you to conquer large areas (as the larger tiles are worth more points), (c) balance growing an area against securing it before another player muscles in, and (d) annoy another players. The 4 special action cards are single-use but can be very powerful if you play them at the right time. One card stops anyone conquering spaces containing neutral yurts without their permission for a whole round; another card does the same but protects the player’s own yurts; another card reserves a conquering tile (as these are limited and the shape you need may not be available later); and, another card lets you take one extra action. Instead of taking their usual 2 actions, a player can spend their entire turn to place one of their yurts anywhere and then discard any of their cards (drawing back up to 4 cards as usual) which can be very useful if your cards don’t match your plans or needs but feels like a high cost. As you can conquer areas containing other players’ yurts, as well as neutral yurts they hoped to use, there’s lots of potential for (humorously) screwing other players. I always like a bit of this aspect in a game as it makes for good interaction. You can also annoy other players if you can use the specific shape tile you can see they will want. 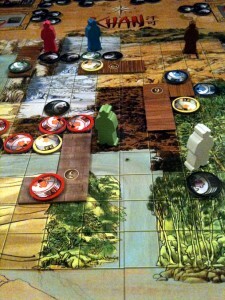 In a 4-player game, it’s tricky to plan ahead accurately as a lot can change before you get your next turn. You can still make plans but you do need to adapt quickly to other players’ actions and you need to try and make it difficult for other players to interfere with your plans, like using special cards. I’m really looking forwards to playing Khan as a 2-player game as I think it will be a very tight and tactical. The theme is different and cool even though it doesn’t really affect the gameplay; however, there was one area I thought could be improved: Having a hand of cards that don’t match the areas where you want to play your yurts can limit your game and this is luck of the draw. You may need to re-think your plans but you’re at a disadvantage against any player who does get the cards they need. So, I’d like to try Khan with a card drafting system (i.e. you pick your next cards from a few face-up cards or from the face-down deck) to reduce the luck of the draw as it can make a difference. Or, alternatively, allow players to discard one card each turn (as players always draw back up to 4). 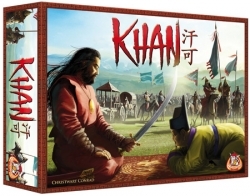 This entry was posted on Tuesday, March 29th, 2011 at 9:21 pm	and is filed under Board Game Review, Board Games, Essen Spiel 10, Khan. You can follow any responses to this entry through the RSS 2.0 feed. You can leave a response, or trackback from your own site.